Since 2012, we (Sophie, Joel and kids Asher and Annika) have been working to regenerate 19 hectares of grazing land near Second Valley, 80 kilometres south of Adelaide, on South Australia’s Fleurieu Peninsula. Our vision for the property is to cultivate a diverse, small farm that meets a large proportion of household food and energy needs as well as providing income. 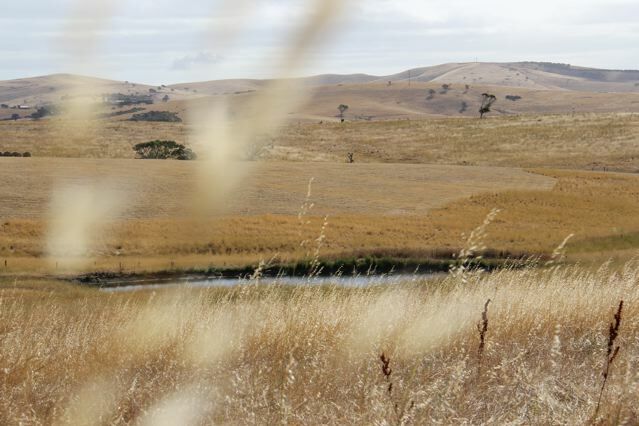 With integrated forestry, grazing, revegetation and horticulture, we are developing Yarnauwi as an experiment in viable, sustainable small farming for the Fleurieu Peninsula. The purchase of the property, Yarnauwi, came after several years of searching and varied experiences of working in the food industry, from retailing to primary production. In 2006, Joel completed his Permaculture Design Certificate at South Australia’s world-famous permaculture farm The Food Forest, spending the following years documenting and advocating for sustainable food and agriculture, primarily through the permaculture and food sovereignty movements. After returning from overseas working on organic farms our visions for the future began to coalesce around the idea of owning a patch of land and living the dream of a regenerative, permaculture-based small farm. Formerly part of the Anacotilla property, Yarnauwi is located about 1.5 kilometres from the coast as the black cockatoo flies, and holds the headwaters of three tributaries that feed into the Congeratinga River. While previous land-uses have contributed to erosion along the creek-lines and converted most of the property to open grassland, the heart of the block is still dominated by two majestic old gums, and there are signs of regeneration nearby with young saplings emerging in the gullies. In 2016, this website documenting the history and development of the Yarnauwi property (under its previous domain name of treesbeesandcheese.wordpress.com) was added to the Pandora Archive of online publications of national significance by the State Library of South Australia and the National Library of Australia. Where does Yarnauwi come from? In August 2014, Kaurna Warra Pintyanthi granted us the name Yarnauwi (“bald (hills) water”) to describe the landscape of our farm. We approached KWP for a property name in acknowledgement of the Kaurna indigenous nation’s long and enduring cultural connection with the South Western Fleurieu. The name Yarnauwi offers both a reference to the form of the landscape, and a historical connection to the nearby Kaurna gathering place Yarnauwingga. The Second Valley region of the Fleurieu Peninsula has been occupied by the Kaurna nation for millennia, and remains rich in indigenous cultural heritage today. It is understood that the region around Second Valley and throughout the Fleurieu Peninsula were maintained through “fire-stick farming” practices prior to European colonisation, maintaining the understorey in an open, grassy form. The Tjilbruke Dreaming Track, which follows the journey of the Kaurna Creation Ancestor Tjilbruke from Kingston Park to Cape Jervis, passes directly through the area. According to Kaurna lore, the springs sprinkled through landscape of the southern Adelaide Plains and the Fleurieu Peninsula were formed by Tjilbruke’s tears. One version of Tjilbruke’s Dreaming Track, recounted in Ron Blum’s local history The Second Valley: A History of Second Valley, South Australia, describes how on Tjilbruke’s journey southwards, “beyond Normanville, he passed a cave on the hillside and then camped on the banks of the Congeratinga River, a half mile to the south, near Wirrina.” Archaeological excavations in the early 20th Century unearthed burial places in a large cave near Wirrina, possibly the same cave described on Tjilbruke’s journey. As part of the Southern Kaurna Placenames Project, Kaurna Warra Pintyanthi have compiled surveys of Kaurna names for the Fleurieu Peninsula. I found a little cove fit to moor a vessel, 70 or 90 tons, in any weather, but there is only room for one; and there is a beautiful stream of fresh water running into the sea … On joining my shipmates on the rising ground above, we beheld a valley three times as extensive as the last and equally rich in soil; there is an abundance of wood all the way, yet no so thick but that agriculture might be pursued without the trouble of clearing. By 1838, farms had been established on the Fleurieu Peninsula, primarily producing wheat. Despite initially pleasing yields from the first flush of a soil that had been accumulating nutrients over millennia, the imposition of European agricultural methods soon saw the soil fertility exhausted, and a shift to grazing within several decades. Historical accounts describe the landscape as primarily being forested with blue gums, together with pink and red gums and stringybarks. European agriculture saw significant land-clearing, further exacerbated by the harvesting of wattle-bark (Acacia pycnantha) for tanning from the 1880s. By the early 1900s, wattle harvesting was in decline, while the highlands behind Second Valley began to be planted for forestry. The harvesting of yakkas for their gum was also emerging as a new industry in the area, while dairying continued its ascendancy. The Fleurieu today still sees livestock grazing as its main land-use, followed by dairying, forestry and improved pasture. 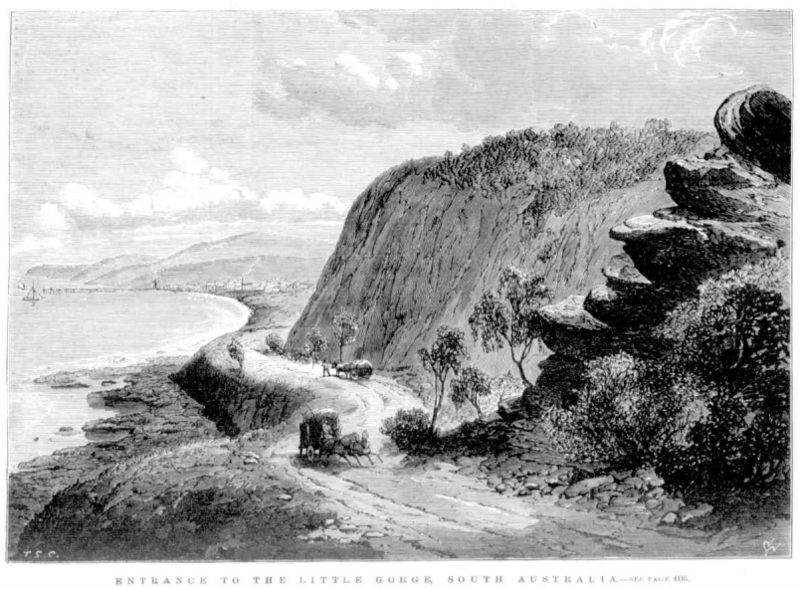 Entrance to the Little Gorge, looking towards Normanville, from the Illustrated Australian News, 20 May 1871, p. 97. Edifying summary, thanks J and S! Thanks for visiting Gillian, hope you can come down to the farm soon! I hope this is the best way to contact you and thanks for your comment on my blog about the swallows on your farm dam. I would really be interested to know what month you saw the swallows. So far I only have records of this behaviour from coastal Victoria and Northern Tasmania and during winter. Hi Jenny, thanks for your response, we saw the swallows hunting in the farm dam just yesterday, so late September, spring. As you can see from the information above, the farm is on the Fleurieu Peninsula, South Australia. I’ll try and post some photos here, or email them to you for your inspection too! Hi Leah, thanks so much for your interest, and all the best with you own permaculture adventures. Your meticulous approach is an inspiration! Aww thank you, you’ve very kind! I like to be able to share my understanding with others, and with any luck, help with the permaculture learning curve 🙂 There are a few things I’m fuzzy on and I hope a combination of practice and mentors will provide some clarity. I’m interested in your post about the visual identity, as I’ve been considering a logo design for my blog too. The Heritage Fleurieu Coast group are trying to encourage locals to participate in History Month next year in May. I think your property would be great to include somehow. Email me if you are interested. Thanks Sue, we’ll be in touch!